Our March Update is here, and it includes a ton of performance updates, game optimizations, balance changes, and more bug fixes than you can cram into the hallowed halls of Blood Covenant! We also have a brand-new season of rewards for you to earn, new items in the store, and some news on our esports plans for 2019! A New Season of Rewards and Custom Games for All! It’s a whole new season, Quakers! Progress through the Season 2 Battle Pass to earn exclusive vanity rewards like the Flintlock Shotgun, Visor’s Plasma Emission System, and the coveted Tesla Lightning Gun! Plus, we’ve added a few new goodies in the store, like the community-created Chibi Icons Pack! Rewards aren’t the only thing players can earn for free this season: we’re giving ALL players access to create their own Custom Games! 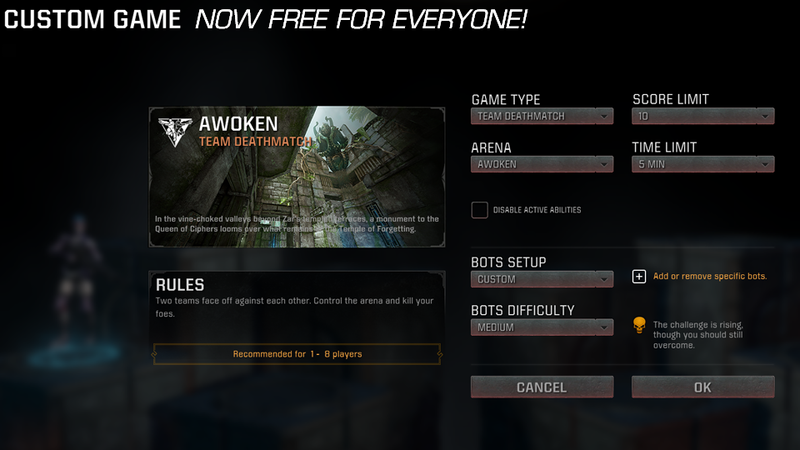 Now everyone can play around with match rules, practice against bots, or just run around the maps. Have fun! We’ve witnessed some of the most exhilarating moments in esports across our Quake Champions tournaments, and we’re just getting started! Our world-class competitors will once again get the chance to prove their skill in the new year-long 2019-2020 season, which kicks off with a Duel tournament at QuakeCon 2019 and leads up to a World Championship at QuakeCon 2020—the 25th year of QuakeCon! There’s much more news to come about how we’re restructuring our esports season this year, and we’re excited to share it with you soon! Full patch notes are soon to follow, but if you want an early glimpse at the best bits of this update (hint: all the bits are good), read on! The March Update includes numerous server networking and client rendering improvements that should make performance feel more consistent overall. In this update we’ve also combed through each of the maps to fix several issues impacting performance, and we’ve squashed an exhaustive list of bugs! While our focus on this update was performance, we’ve tweaked some Champions, weapons, and modes based on player feedback. Notably, Clutch’s shield barrier ability has been reworked: the shield is now a sphere around Clutch that mitigates 50% of incoming damage. Stay tuned for the full patch notes today for complete balance details!